Family LifeCare (FLC) extends special thanks to time-honored supporters – Habegger Furniture Inc.; Hitzer’s; Karen’s Treasures; and, Richard’s Jewelry of Berne. For Family LifeCare’s annual fundraiser which will be held on Saturday, October 6, Richard’s Jewelry donated a Frederic Duclos pendant and earring set. Hitzer’s donated towards a Big Green Egg grill; Karen’s Treasures donated an Ashley end table; and, Habegger Furniture donated a beautiful ceramic bowl. These companies are very active in the community and generous contributors to Family LifeCare’s mission. 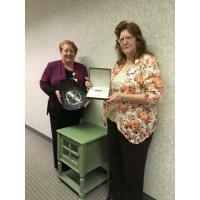 Pictured (left to right) are: SueAnn Reynolds, President/CEO and Lisa Arnold, Development Director. This year’s benefit - Rockin’ the Night Away - celebrates a 1950s theme and will be held Saturday, October 6 at Lighted Gardens in Ossian. Attendees can dress for the theme, if they wish, and enjoy a great evening including hors d’oeuvres; an elegant dinner; a photo booth; viewing some memorabilia from the 1950s; live and silent auctions; as well as, chocolate, wine, and card raffles. Everyone is sure to have a great time.